I recently read Peter Milligan and Chris Bachalo’s series Shade the Changing Man (issues one through fifty) and I feel in 2016 as I felt in 1996 that this was a definitive American comic book of the 1990s. Turning right around, I’m looking at the new sequel series, Shade the Changing Girl, and I wonder what sort of punch the idea can deliver. Though Girl is a sequel, I would like to try and think of it for its own merits if at all possible. If the narrative draws heavily from the classic series, this may not be possible. But if Girl merely uses Man as a springboard then I will push aside comparisons to the older series. 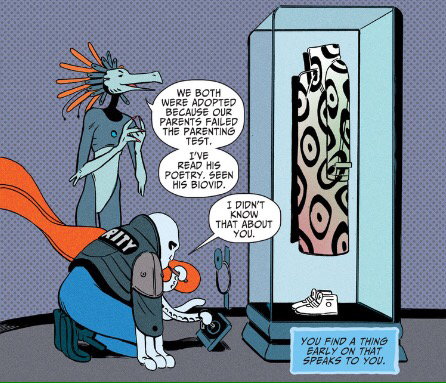 The first issue of Shade the Changing Girl tells me most of what I need to know. But it is difficult to determine how much would resonate or make sense to a person who didn’t just marathon through the 1990s Shade series. This new issue feels accessible but I could never be the judge of that. Zarcone (who I am a fan of) makes this comic work visually. Her sense of composition and her sharply observed human anatomy keep this comic book grounded in reality. Which is very important when a story deals with unreality, manifested dreams and visual distortion. And on that note, the colors: Shade the Changing Girl‘s bright, vibrant colors (Fitzpatrick) immediately draw a firm line of difference between this Shade and the classic Shade. For some unknown reason, Marvel Entertainment did not prepare a Jessica Jones comic book to go along with their Jessica Jones television show. This was a huge mistake. Now, an entire year later, Marvel released Jessica Jones #1. This is actually more embarrassing than DC’s failure to have a Supergirl comic prepared to go along with that television show. At least there had been recent Supergirl series published. No, Marvel’s complete refusal to anticipate the need for a crossover product is straight up negligence. Ignorance. It’s as though Marvel the publisher bet against Marvel Studios. No way this will catch on, I imagine them thinking. They lost that gamble and now they’re caught with their pants down, having bet against women characters. So a year goes by and we have a new Jessica Jones comic made by the original Jessica Jones creative team. Incidentally, the new comic book is no good. This comic only exists because of the renewed interest in the Jessica Jones character which is due to the television program. However, Jessica Jones the comic book character is significantly different than her Netflix counterpart. That difference is not accounted for in this comic book. There isn’t much effort given toward bridging that gap. Further confusion is the problem where Jessica Drew, the original template for Jessica Jones, appears in this comic and resembles the television Jessica Jones on a cosmetic level. Further still, the big twist of issue number one is apparent from the very first conflict with Misty Knight because what else were people supposed to infer besides that something happened to Jessica and Luke’s baby? I assumed that it wasn’t a twist as much as a reference to whatever may have been happening in Avengers comics prior to this. Other than that, it’s a fairly standard comic from Bendis and a workmanlike visual execution from Gaydos. This is a detective comic but I feel that it begins with so many questions that I don’t feel that I have a firm enough grounding in this character’s status quo to be intrigued; I was just along for the ride.